….and his name is Frank Roop. Move over Miles, this is the new man of glam. I am totally smitten with the Boston home that designer Frank Roop created for himself and his wife that was featured in this month’s Elle Decor. It has everything that I love: interesting and luxurious surfaces; natural and tactile materials; contemporary art; vintage furniture (especially French 40’s); dramatic colours; put together brilliantly in a fabulous high-ceiling brownstone. I was drooling so much over his home that I had to check out his previous projects, and they do not disappoint. All of the eight other projects featured on his site are equally as chic, stylish and glamorous so check out his website if you haven’t already! The combination of mosaic tiled floor, venetian plastered walls and his choice of colours looks quite fresh in their entry. The stool is a Robsjohn–Gibbings design that I’ve never seen before. I love this room, to me its simply breath taking. 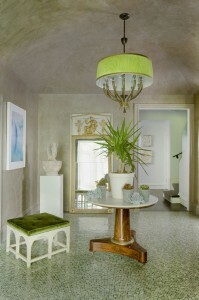 The wallcovering, which is meant to resemble limestone, is by Cannon-Bullock and looks perfect in this room. The mixture of custom made and vintage and antique pieces mix effortlessly in this grandly proportioned room. The other end of the living room – the cover shot – features a spectacular fireplace surrounded by opalescent mother of pearl looking tiles. Another Robsjohn–Gibbings piece in the dining room (the table), an amazing Curtis Jeré sculpture above the travertine mantel, floating shelves and shots of vivid colour make this room a shimmering masterpiece. This is another favorite. The study contains a Jansen desk, an Adnet coffee table, Arbus lighting as well as Roop designed pieces. It’s like a roll-call of all the best designers! 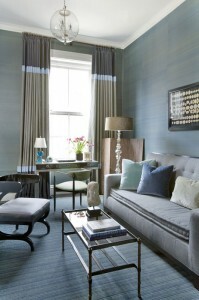 I also have to say the photographer has captured this room so well and ensured the colours still look so ethereal. This shot is from the master bedroom which features a Harvey Probber desk, a Curtis Jeré mirror and other vintage pieces. Simply stunning. Photography of Frank Roop‘s home by Eric Roth, featured in Elle Decor (US) November 2007.